Rose, I was really surprised when you walked into the room, because you looked so familiar. I think it must be because I've got so many pictures of you, on so many recipe books! 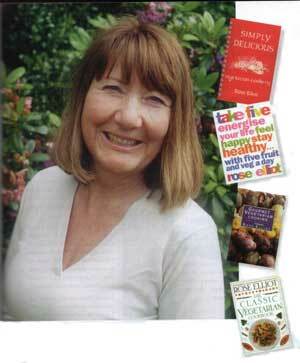 You must he the world's most prolific vegetarian food writer... how many books have you published? I've lost count, but it is in the fifties. Some of them were really tiny, it's slightly cheating to call them a full book really! Which was the first book? The first was Simply Delicious, that one got me going. I wasn't ever planning to be a cookery writer! When I wrote Simply Delicious I was cooking at the retreat centre that my parents and my grandparents ran, The White Eagle lodge. All the food was vegetarian, and people kept asking me for recipes - people weren't very used to vegetarian cooking in those days, but they loved the food! When I was busy with my first daughter, I decided to use the time in between all the things you have to do with babies, to put together a cookery book, and The White Eagle Publishing Trust, which was attached to the retreat centre, brought it out. We just thought it would be a little publication for the retreat, to make some funds for the organisation. But I sent four copies out for review - very, very nervously and timidly - one to The Times, one to Ideal Home magazine, one to the local paper and one to Woman's Hour, and the Woman's Hour one and the Times one brought forth wonderful reviews! People started ringing up, wanting to get copies of the book. We were soon busy packing copies and sending them out, and we had to have a reprint, it was really exciting. That was 1967 After that, I went on cooking, and wrote another book called Not Just a Load of Old Lentils, which was also produced by the publishing trust. Then the publishers Fontana found it, and asked if they could do a paperback version. My original version was spiral bound - I wanted it to he a useful book for the kitchen. published, Fontana wanted another one, so I did The Bean Book that's still in print. Not Just a Load of Old Lentils has only recently gone out of print - they had become a bit dated, those first two, but The Bean Book is still popular, it first came out in 1978 or 1979. I imagine they're been translated for people all over the world. I've noticed in Waterstones you usually have your own part of a shelf! Which of your projects, to date, makes you most proud? I have a very soft spot for my Mother and Baby hook - I've had so many lovely letters from mums about that. I remember working in the merchandise department at the Vegetarian Society many years ago, and it was the biggest seller then - every other order was for the mother and baby book. It's out of print now, but I've got a new publisher who is very keen to republish it, so there's going to be a new edition. I was also very pleased about the books I did with Oxfam, to raise funds for them. I was going to ask you when and where you went vegetarian, but you've prohably been vegetarian all your life...? All my life, really. I have never, ever eaten red meat, I don't know what it tastes like. I did eat some chicken and fish when I was very tiny, because my parents were just becoming vegetarian at the time. Like a of people in this country at that time they had given up red meat and were just eating fish and chicken, and not that often. I remember one night, when I was about 3 or 4, my mother was cooking supper she was preparing herrings, taking out the guts and so on... I remember being absolutely horrified. It was a fish! I wouldn't eat it, and I didn't eat any more fish or chicken after that - I went completely vegetarian then, and my parents followed quite soon afterwards. Today I'm veering towards veganism, but I'm not completely vegan. There are lots and lots of vegans at this conference. You almost feel guilty about being a vegetarian. I know, I find myself making the same sort of excuses that meat-eaters make to me about not being vegetarian. Exactly! I don't ever milk now, I use soya milk and soya cream. I use a few free range eggs, because I think that if it's free range, it hasn't hurt anybody, its' just a by-product of a hen, it would be wasted otherwise. But my daughters are all a bit funny about eggs - they're nearly vegan, too. I use egg replacer a lot, I make vegan cakes and the turn out really well. Cheese is the thing that most people find hard to give up, but I've really gone off cheese nowadays. Is cutting back on cheese a health related thing for you? For me it's both - I've been aware of the ethical arguments against milk and dairy products, for many years, and I've gradually been cutting back. I've never liked the taste of milk, anyway. I like yoghurt, but I make my own soya yoghurt now. I'm beginning to think that cheese tastes a bit... cowy! The less you have, the less you want, I find. A lot of people are saying now that dairy food isn't good for you - a lot of the anti-cancer diets are completely dairy free. whatever happened to whole food? Do people just not want things to be brown any more? It's a very interesting point, and it is actually something I'm quite hot on at the moment, because I think that we've got too far away from our roots, and we're not making enough use of the grains and the wholefoods, really, for our health. And of course they can be delicious! I'm having a bit of a campaign at the moment, you'll notice it in the books I'm working on when they come out - I'm using a lot of whole grains, and wholemeal flour again. It's so untrue! It isn't all brown! And when you think of meat - that's grey! Vegetarian food is absolutely vibrant with colour, especially with all the lovely vegetables you can get these days. Are there any ingredients that you personally dislike, or don't like using? I love garlic, and I adore salad. If I don't get a really good salad during the day I feel really deprived - it's quite hard to get salad in the quantities that I eat it - sometimes when I'm doing a tour I have to rush out to the supermarket! I lose tofu, too. Some of the best tofu is as available by mail order - in my next book I'm going to include details about how people can get hold of the best ingredients with addresses and contact details. There has been a lot of discussion at this conference about the benefits of a raw food diet. Oh, I love raw food, but then, I love cooked foods too! I get really enthusiastic about things! I've been hearing all sorts of health claims for raw foods, but other people have been saying that certain types of people shouldn't eat too much raw food, that it is too 'cooling' for the body. Yes, I've studied a bit about the ayurvedic diet, and chinese medicine too. On the whole I think it is best to aim for a balance in your diet. I do think simplicity is important too, and having as much natural, organic food as possible. Again, I don't eat a completely organic diet who does? I get what I can organic. Well, when I'm working on a recipe book, I'm thinking about recipes, shopping for recipes, testing recipes all day long, so by the time the evening comes, I tend to want something really simple to eat - a baked potato and some salad. Salad is my absolute 'must'. I love gourmet food, of course, but if I had to pick my favourite food, I would have to say salad. I love to cook creatively, but the recipes depend on my current crazes - recently I've been doing a lot of asiatic dishes, Thai food, 'Pacific rim food, 'fusion' food. I love coconut milk and the delicate spices. If we go out, I often choose something I haven't had before, just to see what it's like. I love mushroomy things, I love wild mushrooms. There aren't really any vegetarian restaurants near my home, although I do travel to London a lot. My husband doesn't tend to want to cat out, he always says the food is better at home! It's a nice compliment but it is nice to have somebody else doing the cooking sometimes! We often eat Indian - I love spicy' things. We went to Sri Lanka earlier this year and the food was wonderful. I find it so disappointing when I'm eating out in 'mixed' company, and there is only one thing on the menu I can cat! Have you ever thought about opening a restaurant yourself? I have thought about it, hut I don't really like business very much, I prefer the creative side of cooking, and the writing. I love what I'm doing now. Sometimes when people are opening vegetarian restaurants they come to me for advice - I enjoy suggesting things for their menus but I wouldn't want to do it all the time! What about appearing on TV, would you be interested in doing that? Yes! I do bits and pieces, hut I've been told that there aren't enough vegetarians to warrant a whole series on vegetarian food. It would be nice to work in another medium, but I don't really think of myself as a 'chef', more as a cookery writer. I know you are very interested in astrology - are you still doing that? did charts for people for a while, but I just got too busy with my cookery work - I ended up with a two year waiting list of people waiting for charts, and it wasn't fair to keep people waiting that long, so my husband and I created a computer programme to do this. I did the astrological part and he did the programming - and we set up Rose Elliot Horoscopes, supplying top-quality computer horoscopes at very reasonable prices. Are some star signs more likely to be vegetarian than others? And Aquarians can be, too, because they are very much into new ways, and different ways... Virgo is another one, because they are quite fussy about food and diet, so they might go vegetarian for health reasons - but of course, these are very generalised statements! There are certain signs that you wouldn't expect to be so inclined to go vegetarian - Aries tend to like meat, and Taurus - they just like any food! Tell me a bit more about your forthcoming book. I'm working on a book with BBC Publications: Fast, Fresh and Fabulous - it's coming out in 2003. In a way, the recipes are going back to my roots - a lot of whole grains, but the food is very light, and colourful, and quick to create. I'm really pleased with the book so far - it seems to have an energy of its own, it is just racing along. Often books start with a very solemn introduction about nutrition, and then they follow that with recipes that have no bearing on the introduction at all! So I want my book to be very integrated. There'll be recipes with seaweed, and all sorts of healthy things, as much as I can cram in, and all quick to make. I think 'quick to make' is important these days. I'm looking forward to seeing your cookery demonstration later this week, 'The 30 Minute Dinner Party. It'll be fun, I'm looking forward to it. Food that is quick to prepare is important - people just don't cook, otherwise! They might sit and watch a cookery programme on the television, but then they'll just go out and buy a ready-meal. There's so much pressure on everybody these days. The book is going to he almost entirely vegan, I think. I know! There are still people out there who say they are vegetarians but eat fish and chicken there's an awful lot of work still to he done! You recently became a Patron of the Vegetarian Society - do you hare any plans for any particular type of involvement with the Society? I was very honoured, and thrilled, to be asked to be a Patron. I just feel that I'm available to do whatever they want me to do, maybe if they want me to help publicise something --just to help forward the cause of vegetarianism. It's nice to have a proper link with the Society, we can co-ordinate our efforts now. Would you like me to write some Christmas recipes for you?